Ardiana Culaj, an attorney with Thurswell Law, specializes in medical malpractice and birth injury litigation. Ms. Culaj is a second-generation attorney, following her parents, who served as a prosecutor and a judge in their native Kosovo. She earned a bachelor’s degree with honors in political science from Oakland University in 2003 and a law degree from Wayne State University in 2007. While in law school, she interned for Justice Marilyn Kelly of the Michigan Supreme Court and served as a student attorney in the Wayne State Disability Law Clinic. 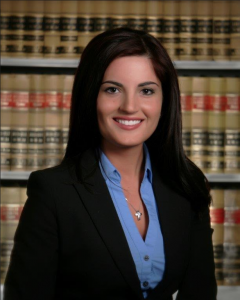 Ms. Culaj is a member of the State Bar of Michigan and the Michigan Association for Justice. She is also admitted to practice before the U.S. District Court, Eastern and Western District of Michigan, as well as the United States Court of the Federal Claims. She serves as a case evaluator on the Mediation Tribunal Association – Medical Malpractice Panel for the Wayne County Circuit Court. In 2015, Ms. Culaj was recognized as one of the top 30 women lawyers in Michigan, following her victory in the Court of Appeals on a wrongful death case involving a non-viable fetus (< 24 weeks gestation). Her determination and zealous representation resulted, for the first time in Michigan history, in the legal recognition of a wrongful death action on behalf of a non-viable fetus. Her major success in Simpson v. Pickens, et al, 311 Mich. App. 127 (2015) has helped pave the way for parents who seek justice and accountability for the loss of their non-viable fetus resulting from negligence. As a result of her efforts, families can seek damages such as the loss of love, affection, society, and companionship for the death of their loved one. Fewer than 10 other states recognize such claims. Ms. Culaj handles complex birth trauma cases against health care providers and has secured multi-million dollars in settlements on behalf of her clients. She was named in the Michigan Rising Stars List 2009, 2013-2018, published by The Law and Politics Magazine®. She is fluent in Albanian. Contact Ardiana Culaj, Thurswell Law attorney, today for your free consultation.